Tell her that you will use your search engines to diagnose her ailments and get to the bottom of them all. Tell her not to worry.Let her know that while these small ills are worth looking into, they are probably also worth a giggle, and they will surely go away. For every lump, bump, rash, pain, pimple and bruise, kids today have constant access to an always on-call “Dr. 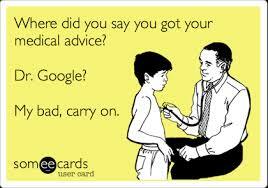 Google” – an omnipresent option for self-diagnosis. But, is the ability to search the Internet’s health sites a good thing for our adolescents – offering them helpful information, self-awareness and self-diagnoses – or are we raising a future generation of hypochondriacs? The fact is, our kids are the first generation to grow up with “Dr. Google” at their fingertips, and we are the first parents faced with negotiating the potentially angst-ridden search results. I know that every time my own 16-year-old daughter observes a physical change in her body, she immediately starts Googling for answers. I listen to her findings and her worries with a mixture of concern, fascination and amusement, and I think, would I ever even notice the “two tastebuds on the tip of my tongue that are white and weird?” Mostly, however, I am exceedingly grateful that she is healthy and has no “big ills” to conquer (fingers and toes crossed, saying a prayer…). She’s certainly not the only one. A recent nationwide study (June 2015) conducted by Northwestern University on “Teens, Health and Technology” looked at the extent and frequency of teen use of the Internet for health information and found that 84 percent of American teenagers consult the Internet for information regarding health, fitness and overall physical and mental behavior. And, the most common reason teens look for health information online is to learn how to take better care of themselves. According to Derek Flanzraich, CEO and Founder of Greatist.com, a popular health and wellness website for Millennials, “There’s never been more health information for Millennials to find, so it only make sense that it’s never been more difficult for them to properly screen, analyze and act on the right data.” This is supported by survey data that finds 37% of Millennials sometimes self-diagnose with health problems that they don’t have. Perpetuating this “search and stress” cycle, 44% say that viewing health information online causes them to worry about their health. The good news for caregivers is that while the Internet is the most popular media source for health information, teenagers still say they get the majority of such advice from their parents. According to the “Teens, Health and Technology” study, 55% of American teenagers say they get “a lot” of health info from parents, followed by health classes at school (32%) and medical providers (29%). Overall, the Internet ranks fourth (25%) as a source of “a lot” of health information. And what about us parents? Most of us are just as wired to “Dr. Google,” and may even feel a parental obligation to use search engines to diagnose on behalf of our family members’ health. Given recent events, this topic is especially relevant, and even visceral. During high school soccer tryouts, my 14-year-old son broke his arm and needed surgery. While I frequently turn to search engines for small ills (e.g. my daughter’s recent allergic reaction to her nickel-based watch), Googling the surgical procedure for a broken radius bone gave me pause. Did I really need to see the details spelled out? Shouldn’t I just trust the advice of our well-respected pediatric orthopedic surgeon? And, would too much information about a medical injury I have no expertise in put me over the edge? Ultimately, once the surgery was over and successful, I did Google around to learn more about my son’s now bionic arm (heretofore known as the “Bionic Boy.”) But, I am glad I left the diagnosing to the pros. So, back to the original question at hand, is the ability to search the Internet’s health sites a good thing for our adolescents? And, if you are still mulling over the best answer to the upfront multiple choice question….Although my good friend Marci assured me that a bent eyelash does really hurt (she’s suffered from this ailment it in the past), the best answer to the question is C.